Dubai our Sandbox: Tips for easy wholesome kids lunch box... what I have learned! Tips for easy wholesome kids lunch box... what I have learned! 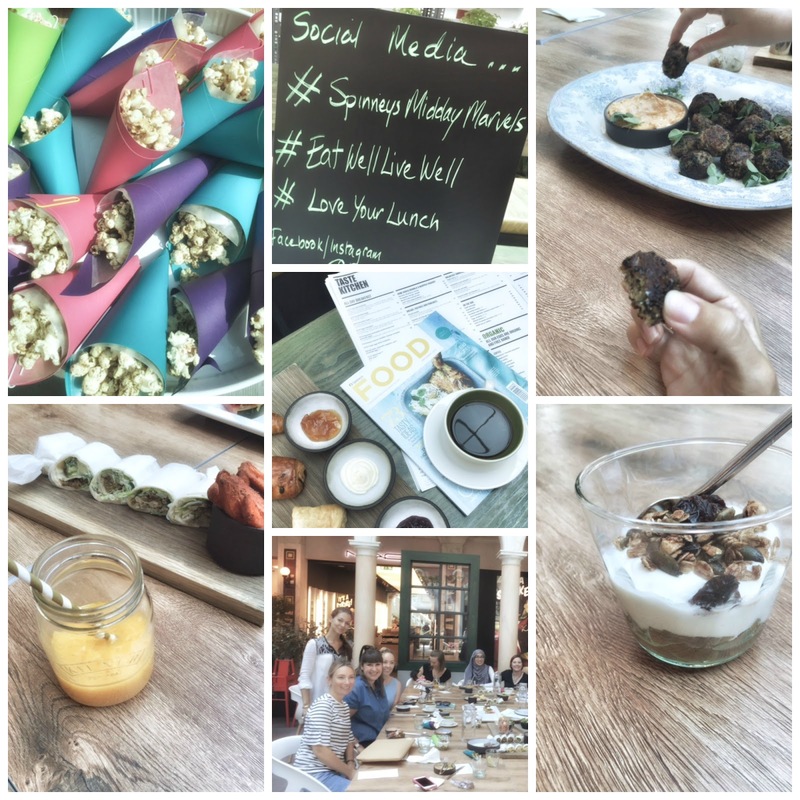 This week, I had a lovely and informative breakfast with the Spinneys team at TasteKitchen. It was great to catch up with other mums and get some inspiration and healthy tips on good and wholesome food for our little ones tummy. I must admit, the girls lunch boxes are quite simple and a bit repetitive. It's healthy and they eat it so I am not too concerned! But variety is not my strength and I would love to offer them more options. That said, Spinneys nutritionist expert Freda Molamphy explain, simple is good if you follow some simple pointers. Here's what I learn and will be applying to our daily meals. Freda explains: " When planning a lunchbox for children, or indeed any meal in general, Mums can often get quite stressed due to the ever-increasing pressure of ensuring that the food included is balanced and healthy." Here's her simple guideline to help you prepare a balance nutritious meals for kiddies. ♥ Try to choose foods that are as close to natural as possible i.e. Minimal processing. This automatically reduces added sodium and sugars which are present in processed foods. ♥ Don’t create separate “children’s meals”. This can encourage faddy eating behavior. Give exactly what the rest of the family are having, but offer it in appropriate in serving size. ♥ Eating together as a family should also be encouraged as this creates a positive attitude to food and also encourages children to eat when they see parents and siblings enjoying the food. ♥ Variety – try to vary foods as much as possible and practical as this exposes children to a whole range of nutrients. If children eat the same foods day in day out then they only get exposure to the nutrients in same and it narrows their food experience. ♥ If children don’t eat much of their meal, accept what they have eaten but don’t offer any further snacks in “compensation” until the next meal as this can encourage a pattern of only eating snacks that they like rather than getting used to regular mealtimes. ♥ When it comes to breakfast – think outside the cereal box!! If children like foods such as meatballs, chicken, cheese, sardines on toast etc then you can offer these for a highly nutritious breakfast. Healthy Starch for energy – Wholegrain breads, bagels and tortillas, wholegrain pasta, rice, grains (quinoa, couscous, bulgur, freekeh, barley etc). Serving size can vary with the age and activity level of the child, but give less more often rather than too large a serving. Protein for growth and overall health – Meat, Fish (especially the oily varieties such as Salmon, Trout, Mackerel, Sardines) Chicken, Eggs, Tofu, Nuts, Cheese. Fruit for vitamins and antioxidants – a portion size is roughly the same size as the child’s hand. Don’t over feed fruit as all fruit has sugars, albeit natural sugars. Try to vary fruit also as much as possible. Berries are a powerhouse of nutrients and usually loved by children. Try to avoid too much acidic fruits such as citrus as they can be irritating for some children. Always remember that eating fruit is far better than drinking juices and kinder to teeth also. Vegetables for vitamins, minerals and antioxidants. Portion size here can be larger than a child’s hand. Children often prefer raw, hand-held veggies rather than cooked. The “Sulphur” notes in broccoli, sprouts, cauliflower and cabbages, when cooked, can be off-putting for some wee folk but do keep re-introducing them on a regular basis as palates develop over time. Dairy for Calcium – a very important part of a child’s diet in order to lay down healthy bones, teeth, hair etc. Always give full fat to younger children so that they get the valuable fat soluble vitamins A. Also, look for a milk that is fortified with Vitamin D where possible. While yogurts are a good source of calcium for children, some varieties are loaded with added sugars. The best option is to choose full fat plain yogurt and blend through some fresh fruit. A little sweetness can be added in the form of honey. Don’t forget Hydration! The best fluids to keep children hydrated are plain water, milk or very diluted fruit juices. Avoid fizzy drinks except for special treats as they contain not only a lot of sugar but also phosphoric acid which draws calcium from young bones. You can make “cheat” version with a fizzy water and some fruit puree. spinneys-dubai.com offers lots of good tips and inspiring recipes for the whole family. 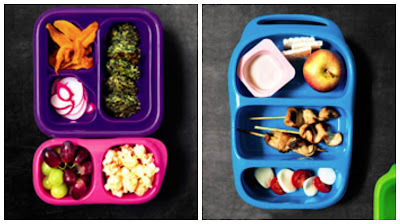 Check out this two Kids Lunch Box ideas with yummy recipes. I tasted the crunchy quinoa falafel and loved it! And mini miso chicken skewers.